This chocolate cake recipe is a simple, sweet caramel filling and turtle candies sandwiched between fudgy brownielike cake layers and frosted with dark chocolate come together in this ultimate dessert splurge. 1. Preheat over to 350 degrees F. Grease 2 (9-inch) round cake pans, and dust with cocoa. Set aside. 2. Beat cake mix and next 7 ingedients at low speed with an electric mixer 1 minute; Beat at medium speed 2 minutes. Fold in chocolate morsels and chopped pecans. Pour batter into pans. 3. Bake at 350 degrees F for 30 to 32 minutes or until a wooden pick inserted in the corner comes out clean. Let cool in pans on wire racks 10 minutes. Remove from pans to wire racks, and cool completely (about 1 hour). Wrap and chill cake layers at least 1 hour. 5. Using a serrated knife, slice cake layers in half horizontally to make 4 layers. Place 1 layer, cut side up, on cake plate. 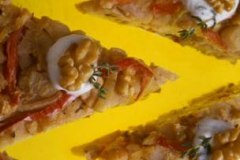 Spread with 1/2 cup cream cheese frosting mixture; sprinkle with one-third diced turtle candies. Repeat proceedure twice. Place final cake layer on top of cake, cut side down. Spread chocolate fudge frosting on top and sides of the cake. Cover and chill in refrigerator until ready to serve. Just before serving, drizzle dulce de leche ice cream toppig over cake. garnish with remaining halved turtle candies and pecan halves. Store in refrigerator. Note: We tested with 2 dulce de leche products: canned and jarred. the canned product is by Nestle and available in a 14-ounce can. 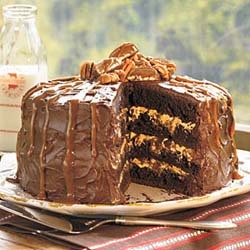 It's quite thick, and when blended with ready-to-spread cream cheese frosting, makes a rich, caramel-flavored filling. Find it in the supermarket with Mexican ingredients. The jarred dulce de leche ice cream topping is perfect to drizzle over the finished cake. Find it in the supermarket with other ice cream toppings.